Stella McCartney, OBE | All You Need Is News! Follow Stella McCartney on Pinterest. McCartney was born in Lambeth, London, England, the second child of Beatle Paul McCartney and American photographer Linda McCartney. She is named after her maternal great-grandmothers (both of Linda McCartney’s grandmothers were named Stella). As a young girl, McCartney travelled the globe with her parents and their pop music group Wings, along with her siblings: older half-sister Heather (who was legally adopted by Paul McCartney), older sister Mary, and younger brother James. According to her father, the name of Wings was inspired by Stella’s difficult birth. As his daughter was being born by emergency caesarean section, Paul sat outside the operating room and prayed that she be born “on the wings of an angel.” Wings toured from shortly after her birth in 1971 until 1980. Born and raised in London and the English countryside, Stella McCartney graduated from Central St Martins in 1995. In 1997, she was appointed the Creative Director of Chloé in Paris. Stella McCartney became interested in designing clothes as a youth. At age thirteen, she made her first jacket. Three years later, she interned for Christian Lacroix, working on his first haute couture collection, honing her skills working for Edward Sexton, her father’s Savile Row tailor for a number of years. She studied her foundation at Ravensbourne College of Design and Communication, fashion design at Central Saint Martins College of Art and Design in the early 1990s. Her graduation collection in 1995 was modelled by friends and supermodels Naomi Campbell, Yasmin Le Bon and Kate Moss – for free – at the graduation runway show. The collection was shown to a song penned by her famous father, called “Stella May Day.” The show made front-page news, and the entire collection was sold to Tokio, a London boutique. The designs were licensed to Browns, Joseph, Bergdorf Goodman and Neiman Marcus. In 1998, she designed her sister Mary’s wedding dress for her wedding to television producer Alistair Donald. A lifelong vegetarian, Stella McCartney does not use any leather or fur in her designs. She supports PETA. Some of McCartney’s designs have text that elaborates on her “no animal” policy; for example, one of her jackets for Adidas says, “suitable for sporty vegetarians” on the sleeve. Stella does use wool, silk, and other animal-derived fabrics in her designs. In 2001, Stella McCartney launched her own fashion house under her name in a joint venture with Gucci Group (now Kering) and showed her first collection in Paris. 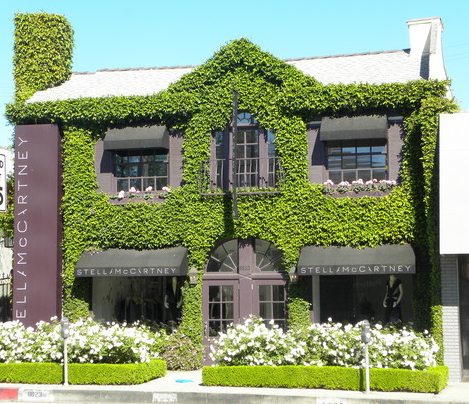 Stella McCartney now operates 17 freestanding stores in locations including Manhattan’s Soho, London’s Mayfair, LA’s West Hollywood, Paris’ Palais Royal, Barcelona’s Passeig de Gracia and Milan, and recently opened doors in Rome and Miami. Her collections are now distributed in over 50 countries through 600 wholesale accounts including specialty shops and department stores. In 2003, Stella McCartney launched her first perfume, Stella. In January 2007, McCartney launched a skincare line, CARE. The 100% organic line includes seven products, from a cleansing milk made with lemon balm and apricot to green tea and linden blossom floral water. In 2008, she launched a new lingerie line. In November 2010, the Stella McCartney Kids collection was launched for newborns and children up to age 12. In June 2012, Stella McCartney personally invited the Soul Rebels Brass Band to perform at her 2013 spring fashion presentation hosted at the New York Marble Cemetery in New York City on 11 June 2012. Other special guests invited to the very private and exclusive party included Anne Hathaway, Jim Carrey, Anna Wintour, Annie Leibovitz, Lauren Hutton, Amy Poehler, Solange Knowles, P’Trique, Greta Gerwig and André Leon Talley. In 2004, designed clothes for Madonna’s Re-Invention Tour, Annie Lennox’s summer tour, and Gwyneth Paltrow’s and Jude Law’s costumes for the film Sky Captain and the World of Tomorrow. She also launched a joint-venture line with Adidas, establishing a long-term partnership with the corporation in September 2004. This line is a sports performance collection for women. The critically acclaimed sports performance collection “adidas by Stella McCartney,” has since successfully grown to include several athletic disciplines including running, gym, yoga, tennis, swimming, golf, winter sports and triathlon. In September 2010, Stella McCartney was appointed Team GB’s Creative Director for the 2012 Olympics by adidas – the first time in the history of the games that a leading fashion designer has designed the apparel for a country’s team across all competitions for both the Olympic and the Paralympic Games. In January 2008, McCartney’s collaboration with lingerie label Bendon was released to department stores, speciality stores and Stella McCartney stores. McCartney was also scheduled, in early 2008, to release a line of handbags for LeSportsac. The collection has 30–40 styles and priced at $200–500. The collection consists of travel bags, luggage, baby accessories and bags for mothers with infants and toddlers. The line is sold at high end retailers, the Los Angeles and New York Stella McCartney stores, select LeSportsac boutiques, and will be available for purchase online. The following awards have recognised Stella McCartney’s achievement in fashion and social awareness: Stella McCartney received the VH1/Vogue Designer of the Year award in 2000, New York. Paul McCartney presented the award to his daughter. She thanked him in her acceptance speech and dedicated the award to her late mother. In 2000, McCartney designed Madonna’s wedding dress for her marriage to Guy Ritchie as well as the Woman of Courage Award for work against cancer at the prestigious Unforgettable Evening event (2003, Los Angeles), the Glamour Award for Best Designer of the Year (2004, London), the Star Honoree at the Fashion Group International Night of the Stars (2004, New York), the Organic Style Woman of the Year Award (2005, New York), the Elle Style Award for Best Designer of the Year Award (2007, London), Best Designer of The Year at the British Style Awards (2007, London), Best Designer of The Year at the Spanish Elle Awards (2008, Barcelona), the Green Designer of the Year at the ACE Awards (2008, New York) and in 2009 she was honoured by the NRDC, featured in the Time 100 and recognised as a Glamour magazine Woman of the Year. In November 2011 she was presented with the Red Carpet Award by the British Fashion Council. She was appointed Officer of the Order of the British Empire (OBE) in the 2013 New Year Honours for services to fashion. In February 2013 she was assessed as one of the 100 most powerful women in the United Kingdom by Woman’s Hour on BBC Radio 4. McCartney and Willis have four children sons Miller Alasdhair James Willis (born 2005) and Beckett Robert Lee Willis (born 2008) and daughters Bailey Linda Olwyn Willis (born 2006) and Reiley Dilys Stella Willis (born 2010).